As new businesses are emerging at an ever increasing pace, organizations are under more pressure than ever to deliver successful projects. They also strive to improve processes, reduce costs, and become more competitive in the process. This is why many consider establishing a project management office in their organization. This is why many consider establishing a project management office in their organization. A project management office, often abbreviated as PMO (not to confuse with Program Management Office, or Portfolio Management Office, which are also called PMOs; or the Project Office (PO)), is a department or a group in an organization that is responsible for establishing and maintaining standardized processes, methods and policies in the organization. The PMO makes sure that projects are aligned with the organizational business strategy. The purpose of the PMO is to increase business value by optimizing project processes and as a result increase organizational efficiency, introducing business standards and methods, and more importantly, ensure that staff complies with these standards. In general, PMOs support project managers and teams in the implementation of the project. The PMO also has a controlling function, making sure that the project team adheres to the established processes and methodologies. They offer training programs to ensure compliance, but also to increase the productivity and efficiency of team members. This is why a PMO also serves as a source of information and knowledge for the project manager and team. Other responsibilities include the selection and implementation of software (such as project management tools). There is no “The One” PMO, each organization will define the role and responsibilities depending on their culture and history. In fact, large enterprises often establish several different types of PMOs within their organization. However, there is one common aspect that every PMO needs to have: Upper management support and staff acceptance. PMOs can only realize their full potential if they have the full trust of everyone in the organization. To ensure the success of the PMO, it needs to be fully aligned with the overall organizational strategy, it also needs to collaborate and communicate with upper management, project teams and staff (Source). Departmental PMOs, often also called Business Unit or Divisional PMOs, offer project support to a specific business unit or department in the organization. The responsibilities of the Departmental PMO include portfolio management, project support (e.g. training), efficient resource allocation, and project controlling. Just as the name implies, Project-specific PMOs are specifically established to support a specific project. When the project is finished, the PMO will also be dissolved. The main functions of the Project-specific PMO is to provide services to support the project team, such as administrative tasks, data management, controlling, reporting and monitoring. The Project Support PMO’s main function is to establish standardized processes and procedures to support project teams across the entire organization. This includes training on practices, methodologies and software tools, but also administrative services for project teams. 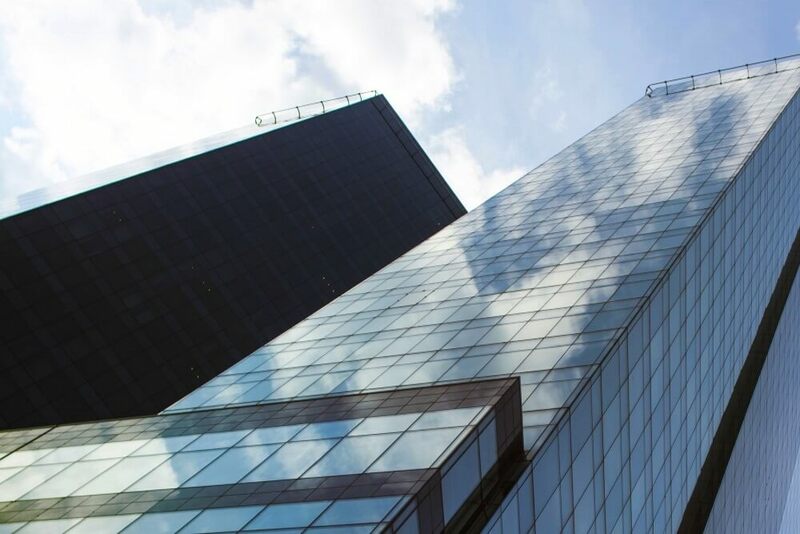 Enterprise PMOs have the most control and responsibilities out of all five PMO types and they report directly to the CEO or president of the organization. Enterprise PMOs make sure that projects align with the organizational strategy and objective. To achieve this, Enterprise PMOs have the authority to make strategic and tactical plans for all projects (see Portfolio Management). The Center of Excellence is kind of a Knowledge Management center, helping project managers and teams deliver successful projects by providing them with the right standards, procedures, methods and tools (see Project Management Best Practices). 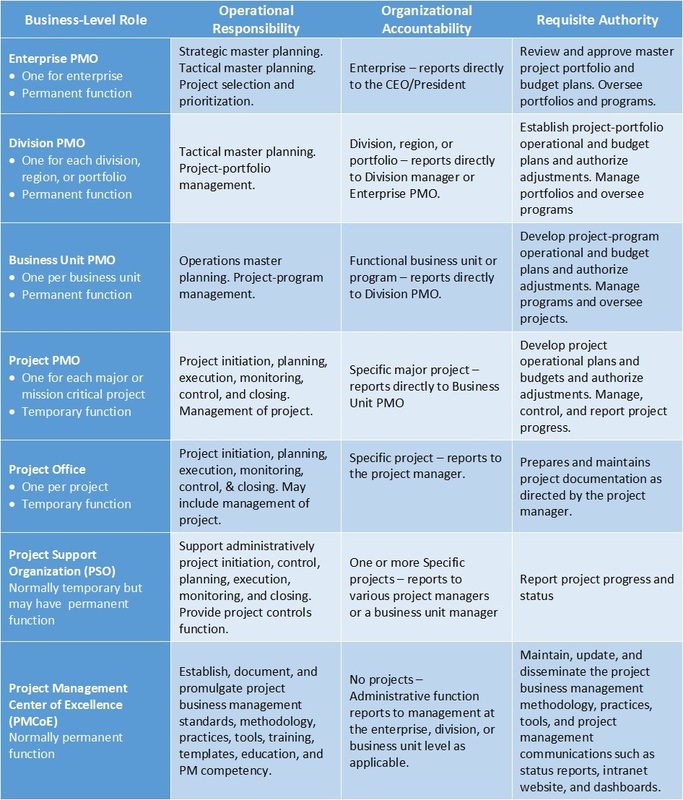 Back to Basics (Part 7): The Different Project Management Office (PMO) Types - InLoox • Copyright 1999-2019 © InLoox, Inc. All rights reserved.